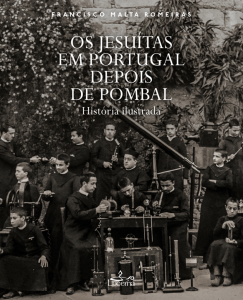 Francisco Malta Romeiras has just published Jesuítas em Portugal depois de Pombal, an illustrated history of the Jesuits in Portugal after their official return in 1858. With more than 250 original photographs of teachers, students, and alumni, this books offers a sketch of Jesuit education in nineteenth- and twentieth-century Portugal. Romeiras is a former Research Fellow at the Institute for Advanced Jesuit Studies. He works at the Centro Interuniversitário de História das Ciências e da Tecnologia at the Universidade de Lisboa. A specialist in the history of science, Romeiras is also the author of a forthcoming book on Jesuit science and education in the nineteenth and twentieth centuries. The book will look into the successful intertwining between theory and practice at the colleges of Campolide and São Fiel, where the Jesuits made significant efforts in promoting a hands-on experimental teaching of the natural sciences. The book will also analyze the role played by the Jesuit journal Brotéria in the circulation of scientific knowledge and in the emergence of new scientific fields in twentieth century Portugal. Much of Brotéria is freely available through the Jesuit Online Library.